"CLIVEDEN" rhymes with "GIVE DEN"
There is a National Trust Restaurant in the Orangery near (north east of) the main house. 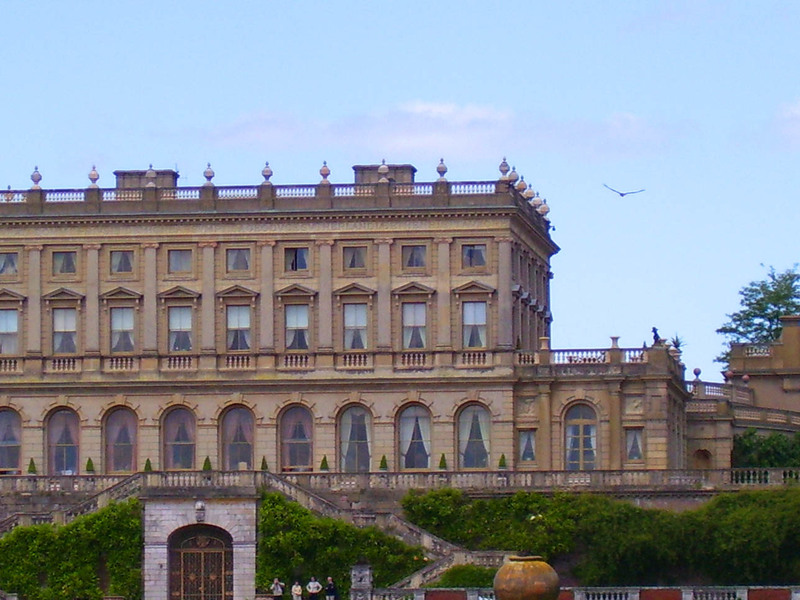 Cliveden House is a Hotel leased from the National Trust, and is not generally open to the public. 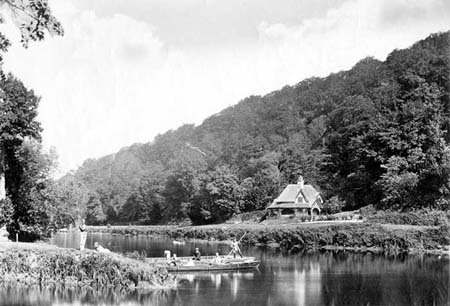 1910: Cliveden in Thames Villages by Charles Harper. In squandering wealth was his peculiar art. The house has been twice destroyed by fire: that which now surmounts the hill was built a few years ago, for the Duke of Sutherland, by the architect Barry. Haunt of Phyllis, Queen of Love! * It is worth noting that Thomson's masque of "Alfred" was first acted at Cliefden, and that, consequently, within those walls was first sung the national song of "Rule Britannia", composed by him and set to music by Dr. Arne, on the occasion of its performance. The bower of wanton Shrewsbury and love." Horace Walpole says of him, "When this extraordinary man, with the figure and genius of Alcibiades, could equally charm the Presbyterian Fairfax and the dissolute Charles; when he alike ridiculed that witty king and his solemn chancellor ; when he plotted the ruin of his country with a cabal of bad ministers, or, equally unprincipled, supported its cause with bad patriots, one laments that such a man should have been devoid of every virtue." The portrait of the Duke has been drawn by four masterly hands; Burnet has hewn it with a rough chisel; Count Hamilton touched it with a delicacy that finishes while it seems to sketch; Dryden caught the living likeness; Pope completed the historical resemblance. His house, designed by Archer (Walpole's 'Groomporter of Architecture'), was much improved and adorned by the Earl of Orkney. It was of red brick, with stone dressings, and had sweeping colonnades and square wings, with a noble terrace 433 ft. long. It was burnt, May 20, 1705, through the carelessness of a maid reading a novel and letting her candle catch the curtains, and then falling down in a fit till the fire had gained head. In 1830 it was rebuilt by Sir G. Warrender of Lochend, after which it was purchased by the Duke of Sutherland, and again rebuilt by him, after a second conflagration, from a design by Barry. The present magnificent house rises from a wide lawn on the heights, raised on a broad terrace. Though very simple, it is exceedingly imposing. The centre is a revival of Inigo Jones's design for old Somerset House. A huge inscription commemorates its second resurrection from the flames, in 1849, under the auspices of its present owners. Frederick Prince of Wales, father of George III., resided here for a short time, during which the first performance of Thomson's masque of 'Alfred' took place in his presence ; and the famous national air of 'Rule Britannia', composed by Dr. Arne, was played for the first time on August 1st, 1710. 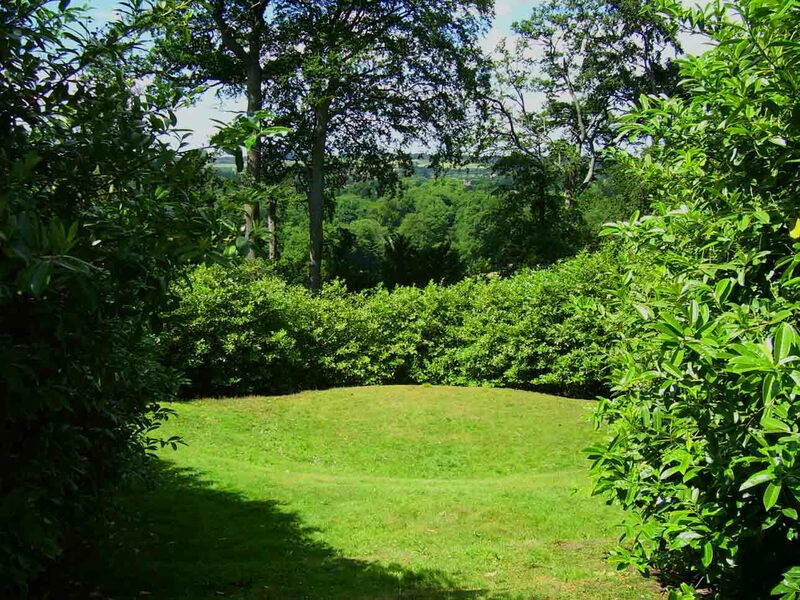 Visitors may gain admittance to the grounds and gardens of Cliefden, when the family are away, on application to Mr. Fleming, the head gardener; the house may be seen by a written order from Mr. Jackson, the Duke's agent. 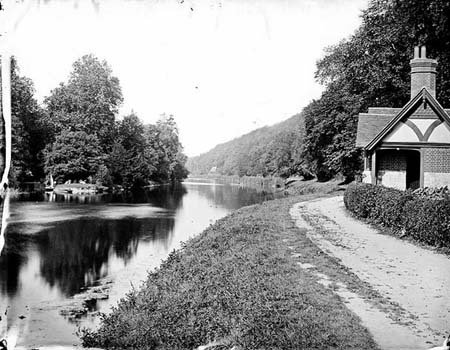 Cliveden reach was the ugliest part of the whole river! "a mountain before a plain; a plain before a suburb, a suburb before a dust heap, a dust heap before a sewer, but a sewer before a gentleman's house" - (note by our communist). Towed on in most beautiful sunset past Cookham. Country very delightful from Cookham Lock onward: hills (low chalk banks call them) fall back from the river which is very wide: the whole full of character. 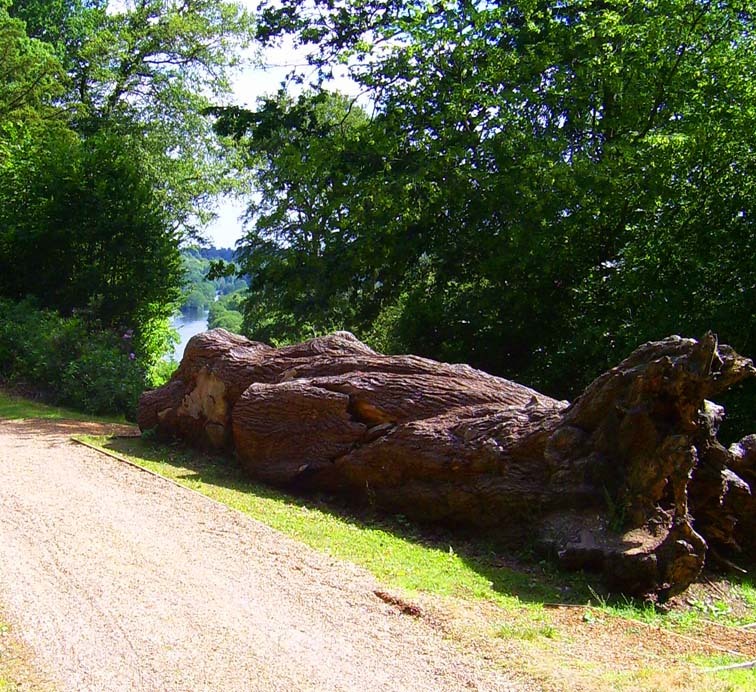 This spectacular estate overlooking the River Thames has a series of gardens, each with its own character, featuring topiary, statuary, water gardens, a formal parterre, informal vistas, woodland and riverside walks. 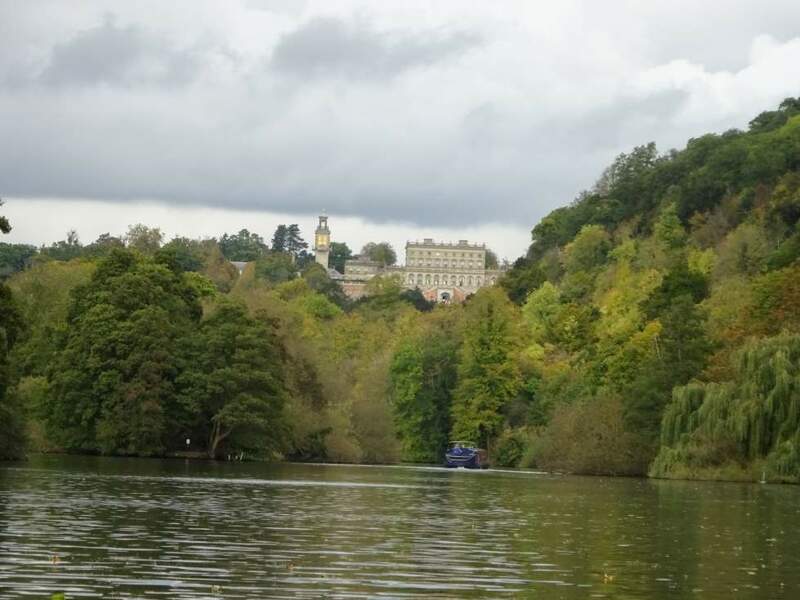 1678-80: The first Cliveden House by George Villiers, the second Duke of Buckingham (E K W Ryan says "the wildest and wickedest roue of all the courtiers of his time"). I went to Clifden, that stupendous natural rock, wood, and prospect, of ye Duke of Buckingham's, buildings of extraordinary expense. The grotts in ye chalk are pretty, 'tis a romantic object, and the place altogether answers the most poetical description that can be made of solitude, precipice, prospect, or whatever can contribute to a thing so very like their imaginations. The stande, somewhat like Frascati as to its front, and on ye platform is a circular view to ye utmost verge of ye horizon, which, with the serpenting of the Thames, is admirable. 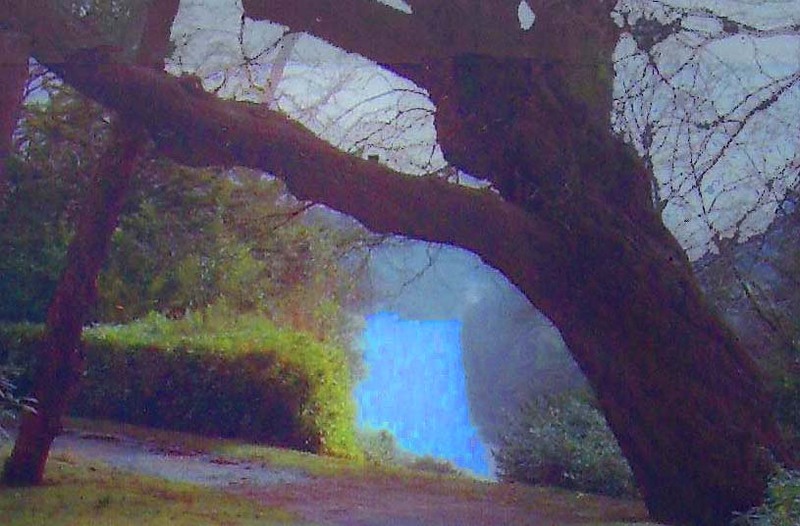 The staire case is for its materials singular; the cloisters, descents, gardens, and avenue thro' the wood, august and stately, but the land all about wretchedly barren, and producing nothing but ferne. Indeede, as I told his Majesty that evening (asking how I lik'd Clifden) without flattery, that it did not please me so well as Windsor, for the prospect and park, which is without compare, there being but one only opening, and that narrow, which led one to any variety, whereas that of Windsor is every where greate and unconfin'd. 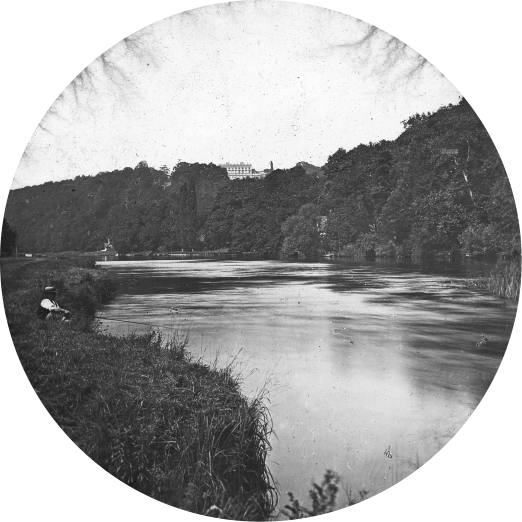 ... the river ... winds beautifully beneath the range of Cliefden Hills, commanding a distant view of Lord Boston's and Cliefden House, which are both so happily situated on an eminence, as to comprise, though not one of the most extensive, yet one of the most richly diversified scenes in the kingdom. 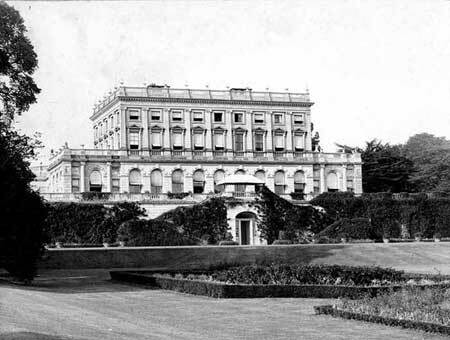 THE terrace before Cliefden House is reported to be higher than that of Windsor Castle. 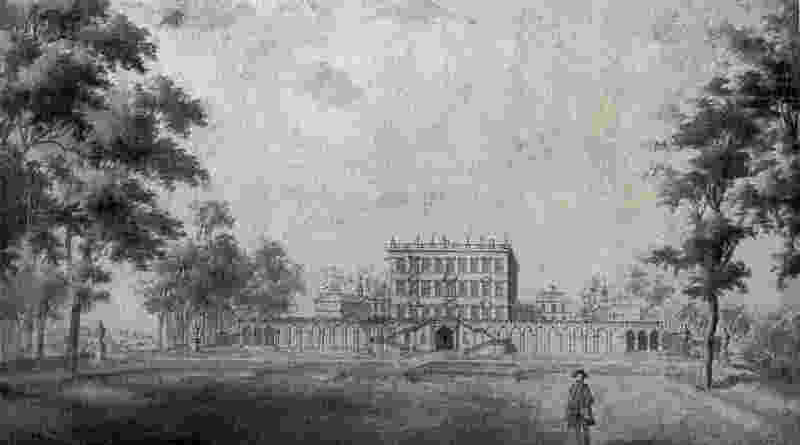 Cliefden House was began by George Villiers the second Duke of Buckingham, in the reign of Charles II. and is evidently copied from the plan of Burleigh on the Hill, the residence of the first Duke, his father, which plan Mr. Walpole tells us was the design of John Thorpe, a folio volume of whose works are in the possession of Lord Warwick. OF George Villiers, Duke of Buckingham, the following lines of Pope, as they are applicable to the present subject, and to the dissipated scene exhibited on this spot, justly claim recital. That life of pleasure, and that foul of whim ! The bow'r of wanton Shrewfbury and love. THE last line alludes to an intrigue between the Countess of Shrewsbury and the Duke of Buckingham, which occasioned a rencontre between the Duke and her husband, in which the latter was slain. It is said, that the Countess, disguised as a page, held the Duke's horse during the combat, and afterwards slept with him in the shirt stained with her husband's blood. AFTER the death of the Duke, which happened in 1688, in the 60th year of his age, the Earl of Orkney made considerable improvements in this house, as did Frederic, the late Prince of Wales, who resided many years on this charming spot. It is now  in the possession of the Earl of Inchinquin, and is occupied by his daughter the Countess of Orkney. 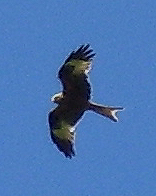 Cliefden. June 1, 1793 J. Farington R.A. delt. J.C. Stadler sculpt. (Published) by J. & J. Boydell, Shakespeare Gally. Pall Mall & (No. 90) Cheapside London. and about 9.30 the servants came in and told us that Windsor Castle was on fire. but on reaching the rectory, from my dressing-room window I could see it was not Windsor Castle. 1795: May 5, Clifden House was burnd down it not in shurd [insured] was. 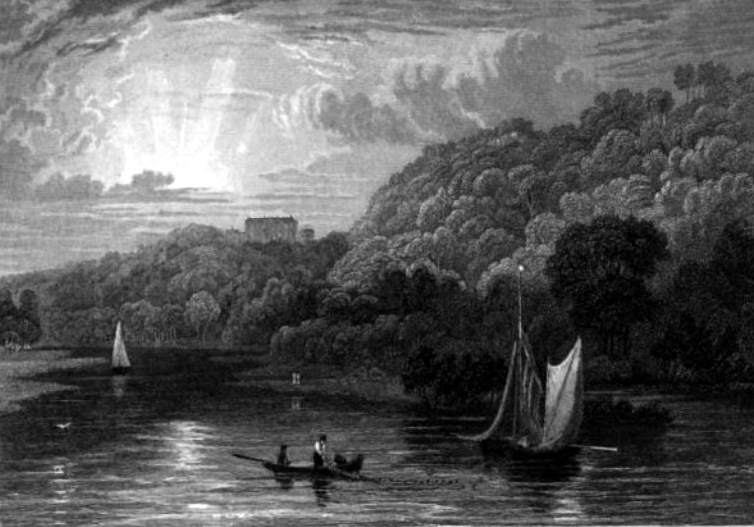 29th July 1795: We had a water-party with the Freemans of Fawley Court, who have a delightful boat, with awning, and every convenience of curtains &c. to keep one from bad weather. We set off for Cliefden Spring. Took up Mr & Mrs Law from Culham Court. It was too cold to dine on the usual turf, so got out, and I walked while everything in the boat was got ready for dinner. We all had curiosity to see the once famous Clifden House, so we set off and mounted a very steep hill. The whole fabric, except one wing, a scene of ruin - the flight of stone steps all fallen in pieces; but what seemed most unaccountable was that the hall, which had fell in, and was a mass of stone pillars and bricks all in pieces, but two deal doors not in the least hurt, looking as if just fresh painted! They were the entrance from the inner hall; an archway over them had fallen in. The fire was caused by the carelessness of a servant turning down a bed. Very few articles of value were saved. The loss is estimated at £50,000. It were to be wished that we could give a similar character [as Hedsor] of the abrupt and shaggy brow of Cliefden, as rich as foliage can make it; but the splendid structure which it bore has not only ceased to form a part of the landscape which we are attempting to describe, but to be the proud ornament of the country round it. Some years ago it was destroyed by fire, and another phoenix has not yet arisen from what little the conflagration spared. 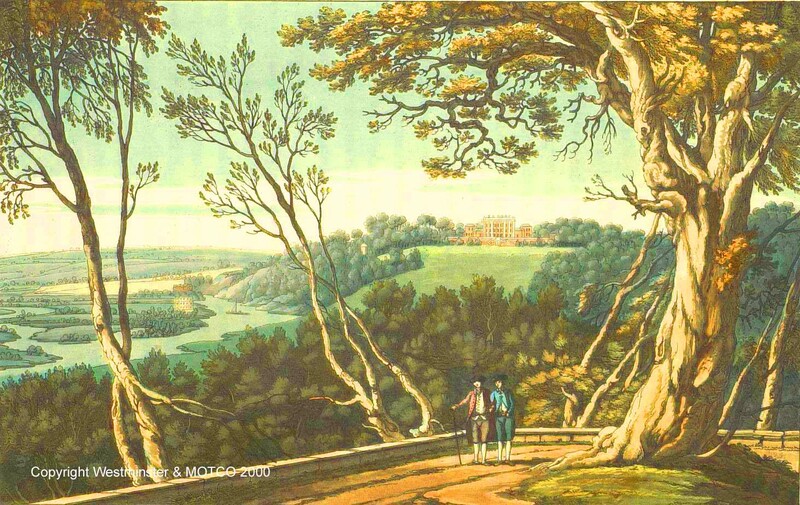 The second Cliveden House also burnt down in 1849. It is said that it was Queen Victoria herself who saw the fire from Windsor and sent her fire brigade. The present house, a stately building and classical in style, was built for the Duke of Sutherland, from the designs of Sir Charles Barry, the architect of the Houses of Parliament. Pictures by W.C.Hughes. Thanks to Pat Furley, research by Dr Wilson. A major work also undertaken in 1740 was the musical arrangement for the masque "Alfred" the finale of which included "Rule Britannia"; the librettist was J. Thomson and to his words Arne wrote the music. 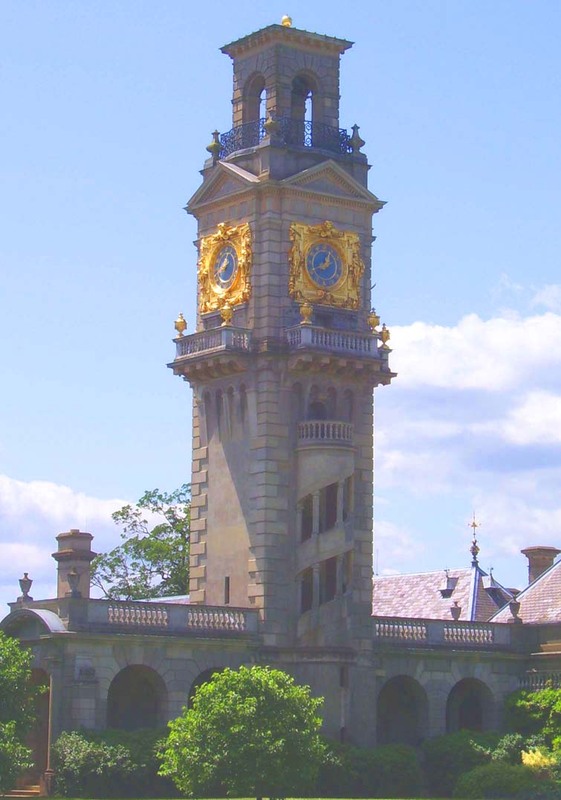 The first performance was given at Cliveden, Buckinghamshire, then the residence of Frederick, Prince of Wales, on the 1st August in commemoration of the accession of George I and in honour of the birth of Princess Augusta. On this occasion the famous patriotic song was sung by the tenor, Thomas Lowe. 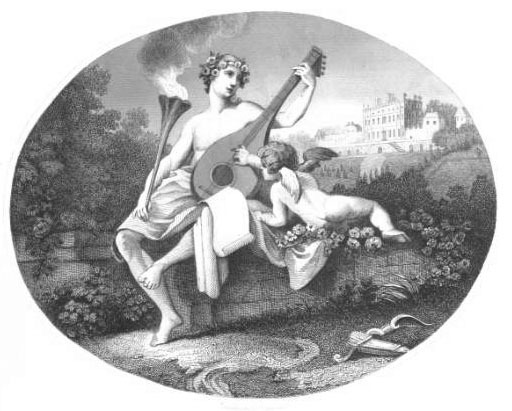 Hymen and Cupid: - Engraved as a ticket for the Masque of Alfred, performed at Cliveden House before the Prince and Princess of Wales, on the Princess Augusta's birth-day.